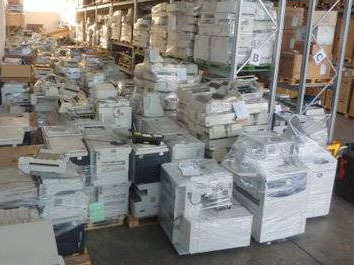 We carry a wide range of refurbished printers in our warehouse to cater to each and every specific requirement that our customers have come to expect from us over our 15 years in the business. 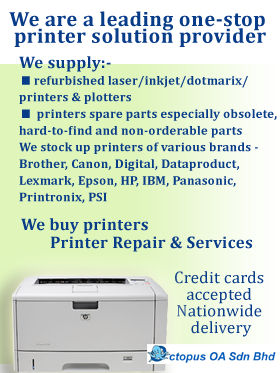 If you do not find what you are looking for in the printer list below, please feel free to contact us ( details at the bottom of this list ) and we will surely try our best to meet your needs. Lj 1160 @ RM 350 + 280 well stocked, ask for bulk discount ! Lj 5000 @ RM 800 + 350 well stocked, ask for bulk discount ! Lj 5000n @ RM 900 + 350 well stocked, ask for bulk discount ! E250dn @ RM 380 + 150 value buy ! ML 4551nd @ RM 600 + 350 now RM 250 only or RM 450 with new toner ! Tally Genicom LA650+ @ RM 1500 add RM 300 only for 1 yr warranty !